Musicians from around the world have always looked to Brazil for inspiration. 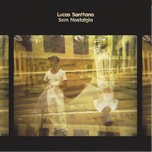 OnSem Nostalgia, producer and singer Lucas Santtana returns the favor. Playing a game of cross-cultural musical ping pong, he weaves his home country’s tropical sounds and rhythms into a vibrant mix of cosmopolitan electronica. Santtana subverts the notion that a Brazilian singer armed with an acoustic guitar will be crooning breezy sambas. But he remains reverent to his culture, offering a delicate balance of bravado and respect.